Amidst the revolutionary tumult of August 1945, a new Vietnamese government began to take shape. Although the young Việt Minh activists who took custody of public buildings in Hanoi on 19 August had almost no experience at governing, they knew enough to use the Post, Telegraph and Telephone (PTT) system to demand and receive allegiance from most northern province offices, and then to blitz the region with edicts demonstrating their authority. On 24 August, Cứu Quốc (National Salvation), the principal Việt Minh newspaper, announced formation of a national "Provisional People's Government," composed almost entirely of ICP members. Hồ Chí Minh countermanded this decision when he arrived two days later, insisting that five ICP members step aside in favor of five hastily recruited "eminent personalities" (nhân sĩ). This Provisional Government of the Democratic Republic of Vietnam met for the first time on 27 August and decided to fix Sunday, 2 September, as National Independence Day. It also released a statement that first identified the provisional government with the National People's Congress convened earlier by the Việt Minh in the hills north of Hanoi, then took a different tack, emphasizing Hồ's instructions to broaden Cabinet membership beyond the Việt Minh. September set the tone of DRV administrative action for the next fifteen months. At least forty-one decrees were promulgated during the first three weeks. Martial law was declared over Hanoi on 1 September, then lifted nine days later. Vietnamese citizens were prohibited from enrolling in the French armed forces, selling food to the French military, or otherwise becoming "lackeys" (tay sai) of the French. The police were given twenty-four hours to investigate suspects before turning them over to the courts. However, another decree authorized the police to dispatch persons "dangerous to the DRV" directly to detention camps (trại an trí). Four existing political organizations were pronounced illegal (see chapter 7). Anyone wishing to mount a demonstration had to notify the relevant local people's committee twenty-four hours in advance. The royal mandarinal hierarchies for education, administration, and justice were abolished, while Mr. Vĩnh Thụy (formerly Emperor Bảo Đại) was appointed advisor to the DRV provisional government. The Empire of Vietnam's yellow standard with the red Chinese character ly was abolished, and the Việt Minh's red banner with its yellow star was declared the national flag. Reflecting the government's parlous finances, another early edict contradicted prior Việt Minh promises of sweeping tax relief by retaining until further notice all colonial-era imposts, with the exception of the especially detested head tax. A national Department of Customs and Indirect Taxes was established; its responsibilities included supervision of continuing salt and opium monopolies, which Hồ Chí Minh and other anticolonialists had been denouncing for decades. Mindful that people might evade existing taxes, the government announced a new Independence Fund to encourage voluntary patriotic contributions (see chapter 6). The government also was authorized to requisition vital materials from private owners, with recompense offered at market prices. Longstanding restrictions on sale and transport of rice were terminated in northern Vietnam, yet the government reserved the right to punish rice "speculators." In a diplomatic nod to the victorious Allies, the government abolished former Governor General Decoux's December 1941 sequestration of American, Dutch, and British properties. Five decrees in early September promoted national education. Top priority was assigned to achieving literacy within one year among all persons nine years and above. Literacy classes were to be free and compulsory for illiterates; fines would be levied on those who failed to learn to read and write Vietnamese (quốc ngữ). Instruction costs would be borne by province- and commune-level people's committees. Night classes were ordered for farmers and workers. A national Department of Popular Education was created, with responsibilities and funding unspecified. Procedures to establish a National People's Assembly (Quốc Dân Đại Hội) were decreed on 8 September. All Vietnamese citizens eighteen years or older-men and women alike-would have the right to vote and to stand for election, with the exception of individuals stripped of citizen rights or persons not of sound mind. A committee would formulate regulations for the first national election, to take place within three months. Another committee was to put together a draft constitution to present to the elected legislature of three hundred delegates, which alone had authority to determine the final content of the DRV constitution. Twelve days later the seven-person constitution drafting committee was announced, composed almost entirely of ICP and Việt Minh members. Notably, no decree specified the geographical territory to which the DRV laid claim. Citizens were left to assume that the borders of colonial Tonkin, Annam, and Cochinchina with China, Laos, and Cambodia now constituted Vietnam's national boundaries. This assumption was strengthened by the mid-October national election decree (discussed below) which specified seventy-one electoral units, all within former Tonkin, Annam, and Cochinchina. The format of these early DRV decrees owed a great deal to colonial administrative precedent, although the content was less prolix. Hanoi bureaus also dispatched hundreds of official telegrams (công điện; télégramme officiel) to subordinate units or local people's committees. All outgoing messages were headed with the words "Democratic Republic of Vietnam. Independence, Freedom, Happiness." Local bodies quickly picked up this formula, and soon many citizens followed suit. Each outgoing or incoming message was assigned a number and recorded in a logbook; on 2 September, a line was drawn across the page of each logbook and a new numbering sequence begun, but communication procedures remained unchanged. Old French file folders were turned upside down and given new subject headings. The blank back sides of old colonial documents were used to type out new messages, reports, and memoranda. The provisional government employed the press to try to convey basic principles, structures, and policies to the public. Selected decrees were dispatched to newspapers for obligatory publication. In early September, Việt Minh papers told citizens to act only on orders from the government. One editorial claimed that "the Vietnamese people (dân tộc) know how to respect discipline, how to obey orders from higher authority". Only two weeks prior the authors of these words had been exhorting everyone to overthrow the existing regime. The new interior minister, Võ Nguyên Giáp, held a press conference to explain how government functions needed to be delineated from Việt Minh activities at all levels. Later, Giáp spent two hours with journalists critiquing the behavior of local people's committees. He urged citizens to forward complaints to a "political inspectorate" being established in his ministry. Giáp also promised to meet regularly with committee chairpersons, open training courses, and promote "New Vietnam Model Communes." It was obvious from his remarks, however, that many local committees were still following their own revolutionary trajectories. Cứu Quốc launched a vitriolic attack on "some people's committees," accusing members of behaving like feudal-era officials, detaining and terrorizing their fellow citizens without reason, shooting into the air to scare people, and confiscating private property unlawfully. "Revolutionary mandarins" (quan cách mạng) were shouting orders, cursing, forcing defendants to kneel down in front of them. If a particular committee failed to represent the people, then Cứu Quốc averred that "the people could possibly overthrow it." On the other hand,editors cautioned citizens to avoid "divisiveness," first joining together to present their grievances to the committee and, if this didn't work, petitioning higher authority. This policy of "criticizing in order to repair" would strengthen cooperation between the people and the government, the editors concluded hopefully. Readers must have wondered what chance a delegation of villagers would have when presenting their complaints to a band of violent youths. It took months of persistent effort before central government legitimacy could be translated into administrative authority in most provinces of northern and north-central Vietnam. Further south, authority continued to vary dramatically from one locality to another. Hồ Chí Minh and his lieutenants wanted the former colonial administrative apparatus to continue functioning under their control, subject to whatever modifications they thought necessary. Working hours for government employees were announced as six thirty to eleven in the morning, followed by a midday break from eleven to two, then an afternoon session from two to five. Saturday morning was work time as well, for a total of forty-two working hours per week. Government personnel were encouraged to use their midday breaks to practice marching, to disassemble and assemble firearms, and to listen to lectures on military tactics. The threat of French return in force hung over everyone. Early in September, Võ Nguyên Giáp alerted all DRV administrative echelons that French troops had reentered Indochina at several places and were proceeding "to butcher our people." Localities facing French assault were to react by destroying roads, culverts, and telegraph lines, and by implementing a policy of "empty gardens and vacant houses" (vườn không nhà trống). This ominous term, used previously by Việt Minh groups evading enemy sweeps in the northern hills, would become painfully familiar to all citizens in due course. Former colonial employees who had taken part in exciting meetings, demonstrations, and group organizing during the heady days of August fully expected to continue such political activities in September. The DRV provisional government, while accepting that all citizens had both a right and a duty to be politically engaged, wanted civil servants to resume their tasks promptly. Nguyễn Xiển, chair of the new Northern Region People's Committee, instructed heads of bureaus and local committees to focus staff attention back on their jobs, to make sure that at least one person remained on duty whenever everyone else was authorized to attend a political event, and to require staff members enrolling in external military or youth training courses to obtain prior permission from superiors. Võ Nguyên Giáp complimented government employees for having formed political organizations, "for example [Việt Minh] national salvation groups," but then ordered them to abandon all decisionmaking roles and limit themselves to offering advice. Younger employees in particular came to regard their day-to-day paper-pushing tasks with quiet frustration, given the continuing revolutionary fervor beyond office windows. Some would soon find ways to transfer to the nascent national army. Reading through September correspondence files, one often notes civil servants using old categories and trying to conduct business as before, even as new realities pushed in relentlessly. Staff often searched for regulations or precedents to justify specific decisions, only to be left in quandaries about which was onerous colonial residue and which timeless administrative wisdom. Sometimes the safest response was to forward the file to another office for decision. The press routinely chided government employees for attitudes of dependency (ỷ lại). Nguyễn Xiển accused many employees of "retaining an indifferent, risk-averse attitude, demonstrating listlessness and timidity in the face of rapid changes in the government system." He exhorted staff to throw aside such outdated behavior, work faster, and above all be punctual-the latter attribute being a preoccupation of provisional President Hồ Chí Minh. Nguyễn Xiển himself possessed an elitist, hierarchical approach to operations, in which the idea that the government belonged to the people had few if any practical consequences. Hoàng Minh Chính, general secretary of the Democratic Party, criticized the government for being "entirely distant from the populace" after a group of petitioners were refused entry to Xiển's office. The DRV provisional government had taken possession of individual personnel files from the colonial era, plus a batch of departmental rosters compiled for the Japanese following the 9 March 1945 coup de force. The PTT roster, for example, listed over 2,400 employees headed by forty-one "cadres européens" (who in fact were indigenous), and 124 senior Indochinese staff members. The Public Instruction Directorate roster included 118 indigenous "cadres européens" and 127 senior Indochinese members, mostly tertiary and secondary teachers. Many government employees based in province or district towns had vacated their worksites hastily during the August upheavals; when they returned, it was usually on terms set by local people's committees, at least until contact was reestablished with departmental superiors in Hanoi. In early October the government allocated fifty-seven departments, bureaus, courts, and agencies of the former Gouvernement général de l'Indochine to the twelve new DRV ministries. The Ministry of Communications and Transport received the most employees, notably those belonging to the PTT and the Indochina Railways Department. The Interior Ministry acquired the sensitive police and political services divisions, minus staff who had departed in July or early August and not returned. As it became obvious that some former Gouvernement général units no longer had a reason to exist, employees were transferred elsewhere, until only a few caretaker staff remained, pending final disposition. All these personnel shifts caused headaches for pay clerks, leading the Finance Ministry to urge that transferred employees continue to be paid temporarily by their prior organizations. DRV ministerial offices in Hanoi were not large, a reflection of their newness and the government's decision to decentralize some operations to regional and provincial levels. In September-October 1945, only about three hundred staff members were spread across twelve offices. Four ministries possessed 58 percent of total staff reported: Communications and Transport; National Economy; National Education; and Interior. Some ministerial offices quickly proved much more active than others. By mid-November, the Interior Ministry's roster had more than doubled, to sixty-five staff members organized into a directorate (3), secretariat (3), gazetteer office (2), press office (5), legal bureau (13), personnel bureau (10), politics and police bureau (12), and messenger pool (17). The Interior Ministry used the telegraph system five times more than the Information and Propaganda Ministry, fifty-seven times more than the National Economy Ministry, and two thousand times more than the nascent Health Ministry. With few exceptions, neither DRV ministers nor former senior colonial employees had ever witnessed a ministerial system in action. The next administrative echelon below the DRV provisional government comprised three regional committees-for the south (Bắc Bộ; Tonkin), center (Trung Bộ; Annam), and south (Nam Bộ; Cochinchina). A Provisional Northern Region Revolutionary People's Committee had been announced on 20 August, with the word "Revolutionary" dropped nine days later, and "People's" changed to "Administrative" at the end of 1945. The chairman, Nguyễn Xiển, introduced above, had obtained a graduate mathematics degree in France, taught school in Hanoi together with Võ Nguyên Giáp, helped to edit Tạp chí Khoa Học (Science Magazine), and been employed in the Indochina Bureau of Meteorology until August. Immediately under the committee was the Northern Region Office (Bắc Bộ Phủ), with 146 staff divided into seven departments: secretariat (22), personnel (16), taxation (14), finance (31), information and propaganda (38), administration (18), and economy (7). Eleven bureaus (sở) and services (nha) reported to the committee: public works, land registration, primary schools, health, veterinary, economy, agriculture, water and forests, labor, prisons, and taxation. Bureaus and services possessed offices in most northern provinces, where staff had experienced the upheavals of August firsthand, some being abused as lackeys of the old regime, others allowed to assist local committees on an unpaid basis. In its end-of-year report, the Northern Region Committee was unable to claim many achievements for its subordinate bureaus and services, and advised that staff numbers were being cut back severely. Yet the committee still aimed to retain these multiple hierarchies extending down to province and sometimes district levels. On 1-2 September 1945, a remarkable meeting of Northern Region officials and representatives from thirteen provincial revolutionary committees took place in Hanoi. Northern Region officials particularly wanted each province (tỉnh), district (huyện), and commune (xã) to designate a single legitimate political body that would bear the standardized name of "people's committee," consist of five to seven members (appointed or elected "depending on conditions"), and be more broadly representative than appeared to be the case with many committees at that moment. Officials also warned that the central government was unable to dispense funds to cover local expenses, hence each province had to use whatever resources they already possessed with extreme care, and mount patriotic fundraising campaigns urgently. After provincial participants were invited to state their own priorities, most did so with alacrity, ranging from Nam Định's concern about losing income from likely termination of the salt monopoly, to Sơn Tây's pressing need for additional youths to guard military equipment obtained from the Japanese. The sober discussion came back repeatedly to questions about which taxes would be abandoned and which retained, how victims of the recent floods could be fed, what sort of criteria should be applied when confiscating or requisitioning property, and how to keep former French enterprises functioning to Vietnamese benefit. Exactly one month later another such meeting took place, this time with representatives from twenty-one northern provinces and cities attending. On this occasion the Northern Region Office prepared an agenda, and most items listed received due attention. Opening the meeting, Nguyễn Xiển first welcomed the interior minister, Võ Nguyên Giáp, then took the trouble to introduce each province chairman around the table. Giáp proceeded to give everyone a brief national appraisal, commenting that central government contacts with the northern region were "partly firm," but that communication with the south remained slow and erratic. With fighting having broken out in Saigon only one week prior, and anti-French feelings running high in Hanoi, Giáp nonetheless eschewed patriotic hyperbole, instead telling those around the table to "work methodically and resolutely to consolidate national foundations (nền tảng quốc gia), [thus] forming a strong bloc in support of our fellow country people in the south." For Giáp, state building and national defense went hand in hand. After Nguyễn Xiển's formal report to the meeting, Võ Nguyên Giáp asked each province chairman to summarize achievements so far, especially in regard to establishing effective people's committees at province, district, and commune levels. The responses were frank and to the point, probably because most province chairmen present were ICP members who appreciated that local knowledge carried more weight at this particular encounter than political rhetoric. Only one province people's committee had been elected (in Vĩnh Yên). The others had made efforts to diversify during September, and now mostly claimed united front representation. Some province committees had slightly more Việt Minh than non-Việt Minh members, while for others it was the reverse. Several committee chairmen added that non-Việt Minh members were assigned less sensitive jobs like justice or social welfare. At one point in the discussion, Nguyễn Khang, who had been delegated by the Interior Ministry to inspect certain localities, revealed that it had been necessary to order reorganization of a couple of province committees because they included only town dwellers, no members from surrounding rural districts. Participants in the meeting also distinguished between those province committee members who were government employees receiving a salary, and those who received local food donations and ate collectively. Within two months, inflation had further reduced the purchasing value of government salaries, compelling more collective eating, yet the distinction between government employees and nonemployees persisted. A number of province chairmen took credit for organizing district people's committees in their jurisdiction, yet the situation remained patchy. In Hà Đông province, Đặng Kim Giang had shifted members of district committees to other districts, while always keeping such outsiders in the minority. Some districts still lacked a committee as of late September, while other existing district committees were being refused recognition by province leaders. Below the district level, canton (tổng) offices were reported by most province chairmen to be out of action; in November, cantons would be abrogated by decree. Very little was reported about commune people's committees. Three provinces stated that about half of their communes possessed committees. Two provinces mentioned receiving requests from villages (thôn) to secede from their commune or to join an adjacent commune, but such initiatives were being discouraged. In the afternoon of 1 October, eight directors of Northern Region bureaus and services met with the province committee chairmen to explain their operations and make requests. The Public Works Department needed province help in repairing dikes broken in the mid-August flood, and hoped that help would take the form of rice to feed workers. The director also asked that documents removed from local Public Works offices in August be returned. Somewhat reluctantly the director accepted that province committees would decide which local Public Works staff to retain and which to lay off. The director of Water and Forests asked that province committees help to stop rampant burning of forests, and facilitate continued collection of resource taxes. The Economic Services director outlined efforts to foster production and distribution of rice, coal, cooking oil, and textiles. The PTT director pleaded with province chairmen to help crack down on highly disruptive thefts of telegraph and telephone wire, and offered to assign replacements for any local PTT employees considered unacceptable. The Primary Schools director apologized that a new curriculum would not be available soon, but foreshadowed a weekly periodical of value to teachers if provinces could help pay printing and postal costs. Finally, the Popular Education director asked province committees to assist in rural literacy efforts, as the government lacked the means to pay literacy teachers or provide paper and pens to pupils. By this point province chairmen must have wondered how they could support even a fraction of government services previously funded from Hanoi. The next morning's session began with a lively discussion led by Hoàng Hữu Nam of the Interior Ministry on how to classify and deal with Vietnamese traitors (see chapter 7). This was followed by an agitated exchange with the finance minister, Phạm Văn Đồng, after he specified that the central government intended to allocate its meager funds to the army, leaving provinces to find their own ways to support essential staff and run top priority projects. Đồng reaffirmed that locally based employees of Northern Region bureaus and services would be laid off unless local committees took up responsibility for their pay and food rations. He did not reveal that the Hanoi branch of the Bank of Indochina was honoring DRV Treasury drafts, probably because he doubted this practice would last. BIC payments to Treasury reached twenty-two million piastres before French officials halted payments on 23 October. On the afternoon of 2 October, four additional government ministers arrived to explain to province chairmen how their portfolios functioned, and to highlight recent decrees, edicts, and public announcements needing the attention of local committees. The minister for information and propaganda, Trần Huy Liệu, sent a letter to alert everyone to training courses then underway for advance propaganda teams. He would be giving course graduates letters of introduction to present to province committees. Liệu cautioned that teams would bring with them predetermined propaganda programs, and were not permitted to go beyond those instructions. Who would feed and house these teams was not explained. That evening, Võ Nguyên Giáp returned with several of his Interior Ministry associates to lead a discussion on organization of commune-level people's committees, taking as precedent the Việt Bắc liberation zone experience in June-August 1945. A proposal to establish "model villages" (làng kiểu mẫu) was debated, but there is no record of such villages materializing in later months. There was an underlying assumption at the meeting that commune committees ought to be the foundation on which district and province committees were built, yet as we have seen the latter still only had a vague idea of what the former were doing. In reality an administrative gap remained between many commune committees formed in August and higher echelons. When Việt Minh activists in Huế announced formation of a revolutionary people's committee on 23 August, it was in the name of Thừa Thiên province, not central Vietnam (Trung Kỳ; Annam). Việt Minh seizure of power in Huế had national importance, as it triggered the abdication of Emperor Bảo Đại, but the regional implications remained unclear. Throughout the central region in August, the revolutionary center of gravity was at the province level, with only limited knowledge of more distant events. ICP members played significant roles in forming province committees, but they did so mostly on their own initiative, without instructions from party leaders. Indeed, throughout the summer of 1945 the party had been unable to reconstitute its Central Region Committee (Xứ Ủy Trung Kỳ), while communications with top echelons in the north remained erratic at best. Not until 31 August were party members from eighteen central provinces able to meet at the office of the former Annam résident supérieur in Huế. They declared a new regional party executive committee, headed by Hoàng Quốc Việt, a northerner, who then immediately departed for Saigon to try to resolve serious differences within the southern branch of the party. In practice, Nguyễn Chí Thanh, newly appointed head of the Trung Bộ Việt Minh Committee, took on regional party leadership as well. Two days following the party meeting, Trần Hữu Dực, recent leader of the uprising in Quảng Trị province, was selected to chair the new Provisional Central Region Revolutionary People's Committee, based in Huế. The same men who had just dealt with party and Việt Minh matters now discussed the business of government, about which they knew very little. According to Dực, the meeting "went around in circles for a whole session, still feeling at a loss," before it agreed to set a target of one month for organizing a viable administrative structure from region to province, district, and commune. The staff of the former résidence superieure insisted that Dực remain cloistered until tailors could fit him out with a Western suit, tie, hat, and leather shoes to replace the battered shorts, shirt, and sandals he had worn since leaving jail. Dực then addressed senior employees of the former administration and met members of the royal family. Eventually the Central Region Committee was able to convene, with Nguyễn Duy Trinh as deputy chair, Nguyễn Chánh responsible for defense, and ten other members supervising the existing regional bureaus and services which also were meant to report to ministries in Hanoi. In early 1946, the committee was pared down to five members, but with an unwieldy total of twenty-one directors of specialized bureaus reporting to it. Dực managed to travel to all eighteen provinces under his jurisdiction, although after January 1946 it was no longer possible to go further south than Phú Yên, due to French military advances. Meanwhile, the DRV central government dispatched thousands of national decrees, edicts, instructions, and letters to the Central Region Committee in Huế. One of the first messages from Hanoi instructed each regional committee to prepare a realistic budget, to contact province-level committees urgently, to devote special attention to repairing roads and bridges, and to account to the government for any funds drawn from local Treasury (Kho Bạc) offices. It appears from the files that most correspondence addressed to the regional committee was routed directly to one of the specialized bureaus for action. Outgoing traffic also showed little evidence of regional committee involvement. The Northern Region Committee in Hanoi sometimes dispatched messages directly to province committees in the central region, bypassing the Trung Bộ committee in Huế, a practice not permitted in the north. Clearly the Central Region Committee exercised much less authority over specialized bureaus and province committees than was true of the Northern Region Committee in Hanoi. Communications specialists in Huế maintained regular contact with all central region provinces until early 1946, when committees from Phú Yên southward had to flee French attack. The telegraph system functioned as far south as Đà Nẵng in April, but soon after that Huế itself became terminus of the telegraph line running through the coastal provinces from Hanoi. Telephone connections were more erratic, although the line between Vinh and Hanoi functioned well. The main Huế radio transmitter was employed to send Morse code traffic to local committees and military units, including some operating behind French lines. A number of provinces kept their own rudimentary internal telegraph and telephone networks operating. The official mail system continued to reach most provinces and districts in central Vietnam, although foot couriers and boats often had to substitute for erratic train or motor transport. In central Vietnam, the demarcation between DRV civil administration and ICP-Việt Minh operations was often blurred or ignored, whereas in northern Vietnam the distinction was taken seriously throughout 1945-46 and beyond. ICP activists in all regions often showed their dislike and distrust of employees of the former colonial regime, although particularly in the north they might accept grudgingly the need to use some temporarily. Not surprisingly, this reduced the effectiveness of cooperation between employees, and led some to switch their services back to the French when the opportunity presented itself. Even those Trung Bộ ICP members who encouraged old regime personnel to continue working saw nothing counterproductive about Việt Minh committees seizing public property, levying informal taxes, meting out their own punishments, and otherwise duplicating or negating the functions of government. By the summer of 1946 the party seemed to be trying to separate administrative committee and Việt Minh responsibilities. Nguyễn Duy Trinh, deputy chairman of the Trung Bộ Administrative Committee and an ICP member, managed to reduce overlaps at regional level. At the province level and below, however, confusion persisted. The Southern Region Committee received packets from Hanoi containing the early DRV decrees outlined above and managed to forward copies to some Mekong delta provinces before being forced to flee Saigon in late September 1945 (see chapter 3). The committee subsequently regained two-way shortwave radio contact with Hanoi, while some other southern venues possessed receivers capable of picking up Voice of Vietnam transmissions in Morse code. We know from documents captured by the French army in late 1945 that DRV adherents in southern provinces as distant as Hà Tiên and Rạch Giá were employing government nomenclature identical to that found in central and northern Vietnam. Very soon, however, the Southern Region Committee felt the need to innovate, for example designating three "political inspectors" for eastern, central, and western Nam Bộ. It then sought to delineate responsibilities for "resistance committees" (ủy ban kháng chiến) that had formed separately from local people's committees. This issue arose wherever it became necessary to engage the French in battle. In 1947, based partly on prior Nam Bộ experience, the central DRV government would decree the merger of military and civil bodies into "resistance and administrative committees" (ủy ban kháng chiến hành chính) at province, district, and commune levels. Phạm Văn Bạch, chairman of the Southern Region Committee, made a frantic attempt to bring together communist, Catholic, Hòa Hảo (Buddhist), and Cao Đài faithful to sustain , armed struggle against French reoccupation of Cochinchina. In early 1946, another well-known lawyer, Phạm Ngọc Thuần, was designated deputy chairman of the Southern Region Committee. Three months prior, the French Sûreté had put Thuần under house arrest, but he soon escaped Saigon by bicycle to join the maquis. Thuần found himself under heavy suspicion until he and a physician friend built a workshop to make grenades and mines to give to local combatants. When offered membership in the ICP, Thuần arranged for his initiation ceremony to take place on Bastille Day 1946. Noted professionals like Bạch and Thuần retained the respect of some former colonial public servants, religious leaders, and businessmen. Bạch was ordered north in February 1946 to represent the south in government deliberations, chaired the Southern Resistance Committee in Phú Yên from late 1946, and did not return to Nam Bộ until 1948. Other Southern Region Committee members were scattered across the Mekong delta, mostly keeping in touch by courier. On one occasion the committee did manage to convene a meeting of representatives from all provinces of Nam Bộ. Amidst the fighting and moving, however, the committee was in no position to direct the region's administration, which devolved to leaders of the eastern, central, and western subregions (now numbered as khu 7, 8, and 9). Nonetheless, with DRV adherents in the south cut off from the national government in the north for months at a time, the roles of regional committee members remained significant. The committee put its name to public declarations and to correspondence with foreign organizations which in the north were the prerogatives of President Hồ Chí Minh. Finally, the Southern Region Committee offered a visible alternative to the "Cochinchina Republic" being pieced together by the French. In November 1945, the DRV provisional government issued a decree on composition of people's councils (hội đồng nhân dân) and administrative committees (ủy ban hành chính) which has continued to shape local government in Vietnam to the present day. A committee headed by Võ Nguyên Giáp had prepared a draft to discuss with province heads, then present to the Cabinet. While affirming the "great success" of the local committees that had sprung up during the August Revolution, conditions were now said to be sufficiently stable and the form of government (chính thể) sufficiently clear that it was time "to organize the people's authority in a unified, rational manner, and to demarcate powers transparently." At the commune and province levels, people's councils selected by popular election would have the authority to issue resolutions, choose the administrative committee at the same level, set a budget, collect fees, own or rent property, and participate in business enterprises of public benefit. Administrative committees would function at commune, district, province, and regional levels, thus eliminating the canton (tổng) and prefectural (phủ) levels of local government that had existed for hundreds of years. Relatives were prohibited from sitting on the same administrative committee, and not all committee members had to be natives of the territory encompassed-both clauses designed to reduce the propensity to form local cliques. The public had the right to attend people's council sessions but not to raise questions from the floor. Administrative committees would normally meet behind closed doors. Although this November 1945 decree intended that councils and committees serve the interests of inhabitants of the specific territory involved, it simultaneously placed each council and committee under extensive scrutiny from higher echelons, and provided punishments for any body that contradicted government decrees, edicts, or instructions. The outcome of all council and committee elections had to be ratified from above. Budgets had to be approved, as did any proposal to buy or sell property, set new fees, borrow money, let contracts, or initiate lawsuits. If a people's council issued a resolution contrary to higher authority, it would be told to rescind or correct the document. If it refused, the council could be dissolved and new elections ordered. Administrative committees were instructed bluntly to "carry out the orders (mệnh lệnh) of higher echelons." If they did not, the committee could be discharged and offending individuals removed from council membership. The constitutional principle of dual accountability had yet to be formulated, but local committees already faced the problem of how to satisfy both their constituents and the state. By the end of 1945, thousands of local committees had already conformed to government instructions and changed their name to "administrative committee." From the government's point of view, these committees were still only provisional, pending people's council elections which would lead to selection and ratification of proper administrative committees. As we shall see, some council elections did take place during 1946, at least in northern Vietnam, yet in many cases councils failed to gain control over their administrative committees, whose members had been working together since the August Revolution. Phạm Văn Đồng's early October warning that the central government lacked funds to pay public servants appears not to have been heeded. Some heads of departments and committees probably thought the minister of finance was bluffing. In late October, a number of province committees warned Hanoi that most of their remaining funds would be consumed if they met that month's salary obligations. The government reacted by ordering all public servants employed for thirty years or more, and all those aged fifty-five and older to retire immediately. It also discontinued severance pay for retirees, and froze all personnel promotions until further notice. Shortly thereafter the government encouraged employees to consider applying for six-months leave without pay, with the possibility of extension. Behind this latter initiative lay the expectation that many individuals taking formal leave would continue to work, relying on a combination of family ingenuity and popular donations, until such time as the government's financial situation improved and pay could be resumed. In following weeks each administrative unit submitted a roster to the Interior Ministry that indicated who wished to take leave without pay, who was retiring outright, and who had moved to another unit. The Northern Region Office managed to reduce its own complement from 155 to 103, although only four were retiring and eleven taking leave without pay (or with half-pay), compared to thirty-one transfers. The sixteen bureaus and services under its supervision had much less success in reducing staff numbers. Among eleven units reporting, with a total complement of 3,875 employees, only 163 individuals were retiring, 37 taking leave without pay (or with half-pay), and 68 transferring elsewhere. Adding thirty dismissals and one death, this still amounted to a meager 2.6 percent reduction in staff. Province-level staff cutbacks were more substantial, yet the number of employees who remained was still well beyond the capacity of province committees to pay them. Provinces told the Interior Ministry that essential employees were threatening to resign, and warned that further reductions could cripple operations entirely. Hundreds of employees sent petitions to Hanoi to complain that inflation was making life extremely difficult for them at current pay levels. Sometime in December the central government quietly accepted that locally negotiated pay reductions were preferable to large-scale resignations or dismissals. The large amount of work that province offices had put in to make recommendations for keeping or dropping individual employees was largely wasted. Many employees were prepared to stay if adequate food was provided from a combination of state and local sources. As they were for the most part former members of the colonial system, these employees also regarded participation in the DRV administration as offering protection against revolutionary harassment. At the local level, however, government employment proved no guarantee against harsh treatment. In late December, Trần Văn Của, director of the Northern Region Public Works Department, wrote a caustic letter to superiors on behalf of his exasperated senior engineers: "They are routinely belittled and terrorized. For example, Mr. Trường has been arrested without cause. Mr. Khánh is currently detained without anyone knowing the reason, or who is responsible. At present my ranking employees are all confused and discouraged, and I lack any authority with which to offer them encouragement." Của concluded that most of his engineers nonetheless did want to continue working, despite such local maltreatment and despite considerable material sacrifice. Tax collectors and customs officers often found themselves in similar circumstances (see chapter 6). Many northern province committees had retained former district mandarins as "advisors" in August, and subsequently employed them as "specialists." When there were calls to dismiss these former district mandarins or force them to retire, a number of province committees raised objections. In early November, the Interior Ministry told lower echelons to select only a few former mandarins to remain on new contracts at lower pay. Better yet, former mandarins could work without any pay, "like many Ministers and other persons helping the Government in its endeavors." A month later the Finance Ministry ordered all former mandarins to sign new contracts that included a 25 percent pay reduction. This met some opposition, not on financial grounds, since inflation was eating relentlessly into everyone's pay packet, but because it meant former mandarins being singled out. In its end-of-year report, the Northern Region's Office of Personnel admitted that it had barely begun to process employee requests to retire, although it had arranged for five hundred pre-August retirees to continue receiving their pensions. Simultaneously it was trying to identify worthy employees and keep them working at lower pay. Many individuals who had abandoned their provincial posts hastily in August and congregated in Hanoi now wished to resume duties, but the Finance Ministry had yet to reply about funding. The end-of-year report concluded with a blunt assessment: inflation was turning salaried employees into paupers, yet those suddenly instructed to resign were finding themselves even worse off. Meanwhile, presumably on ideological grounds, the wages of working-class state employees had been increased, not reduced. All other government employees had had to accept lower pay or take leave without pay and continue working, perhaps in a different unit. By January 1946, many employees had sent their dependents to ancestral villages to subsist, while they themselves ate together with office mates. This solution to feeding government employees would persist for years to come. On several occasions the Vietnam General Association of Government Employees tried to intercede with the provisional DRV government about pay and conditions, but its leaders were tainted by prior associations with French and Japanese officials. Newspapers carried scores of letters from continuing or retrenched employees describing their economic plight. Claiming not to be bitter, a fired employee in Huế accepted that he had "done wrong in the past and needed reeducation." He now took part eagerly in political demonstrations and participated in several organizations, but remained unemployed. Another contributor to the same paper argued that professional expertise was less important for government employment than virtue and "loyalty to people's interests." In January 1946, the Interior Ministry felt it necessary to deny rumors that a further round of sackings was imminent. In February, the principal Việt Minh paper foreshadowed election of national office bearers to the alternative General Association of Government Employees for National Salvation. Several months later, two hundred people met in Huế to form the Thừa Thiên Government Employees Association. In precolonial Vietnam, province seats had exuded state gravitas compared to the modest prefect and district offices immediately below them. The colonial authorities reinforced this tradition when they placed a French résident in each province to supervise Vietnamese personnel down to commune level. Most provinces also possessed specialized units that reported to Gouvernement général de l'Indochine offices in Hanoi. The French had also increased the number of provinces to sixty-five compared to the thirty-one delineated by Emperor Minh Mang in 1834. When declaring independence in early September 1945, the DRV provisional government was content to retain colonial-era province names and territorial demarcations. A number of province committees preferred new revolutionary designations, usually the name of a local anticolonial martyr, and they proceeded to employ this identification in messages sent to Hanoi. However, none of those name changes gained central endorsement. Within several months they faded from province-initiated correspondence, although they were often retained in local speeches, banners, and poetry. Amidst the revolutionary euphoria of August 1945, most Vietnamese believed that colonialism and war were being left behind in favor of independence and modernization. The late-September British-French coup de force in Saigon cast a pall over such assumptions. Ho Chi Minh tried to negotiate a mutually advantageous relationship with France, but meanwhile told his lieutenants to plan for a war in which the nascent state might have to survive without allies. In this landmark study, David Marr evokes the uncertainty and contingency as well as coherence and momentum of fast-paced events. 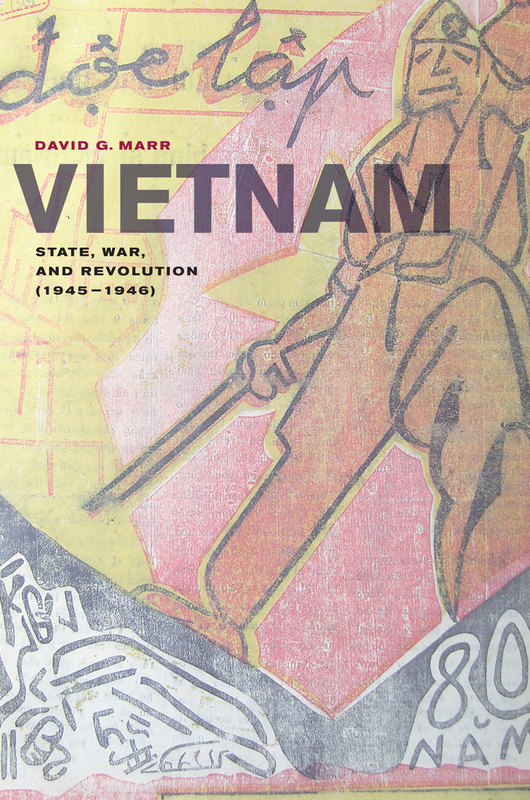 Mining recently accessible sources in Aix-en-Provence and Hanoi, Marr explains what became the largest, most intense mobilization of human resources ever seen in Vietnam. 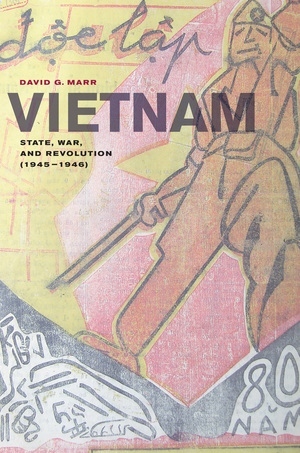 David Marr is Emeritus Professor of History at Australian National University and the author of Vietnamese Anticolonialism, 1885-1925 (1971), Vietnamese Tradition on Trial, 1920-1945 (1981), and Vietnam 1945: The Quest for Power (1995), all published with University of California Press.